Picture this… sitting in a tub full of hot and healing mineral water with a few of your most favorite people in the world. You’re sitting under some beautiful pine trees, on a small hill, looking out over a glorious Rocky Mountain View. While you’re breathing in the fresh mountain air, you can’t help but to fully decompress and relax as the hot water soaks into your bones, rejuvenating your body and mind. Sounds pretty damn good, right? Well… us mountain dwellers are lucky. 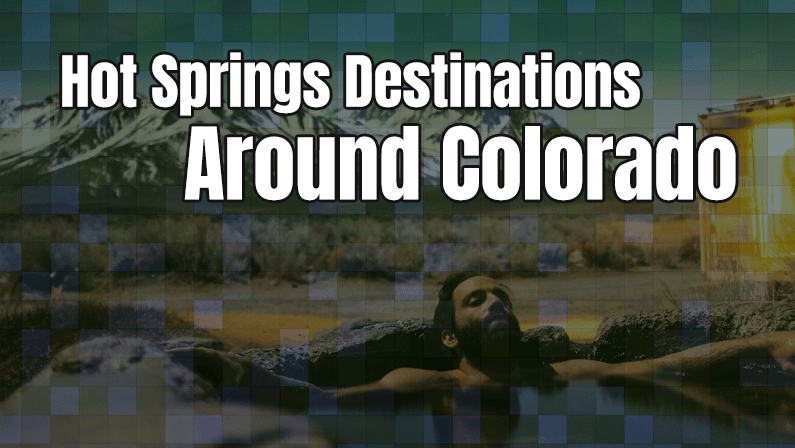 Colorado is home to a number of natural, and man-made, hot springs that are a short drive from Denver. So, if you’re ready to relax and recover, start making your way towards these eight must see hot spring destinations around Colorado! With rustic lodging options and body work massages that take place in geothermal waters, this is one of two must-see hot springs in the Steamboat Springs area. Make note, clothing is optional after dark. Looking to make a full day of your hot springs experience? Old Town Hot Springs is the perfect location with private cabanas, childcare, tennis courts, fitness center, water slides, massage services, and eight geothermal pools to choose from. This luxury resort is the perfect place to stay and relax after a long day on the slopes of Wolf Creek. There’s a full-service spa, hotel, and over 20 soaking pools including adult only pools and the world’s deepest geothermal spring. Juniper Hot Springs has been used for centuries; but was only just opened to the public in 2015. You’ll find a low-key vibe and mineral rich pools that range from 80-103 degrees. If you’re looking for a unique way to experience the San Luis Valley, then you should check out these hot springs. It’s off-the-grid, all-natural, and clothing optional. Make reservations, this place can book up quick! Want to get creative and stay in a yurt or in a tiny tipi village after you soak? Yeah? Then you should visit Joyful Journey Hot Springs in Moffat. Want a massage in a historic sandstone bathhouse? Sounds lovely, right? Experience this, along with the world’s largest hot springs pool, water slides, mini golf courses, and a full-service spa at the Glenwood Springs Hot Springs Resort. With a freshwater family pool, elevated whirlpool spa, and 16 mineral hot springs, this hillside attraction right by the Colorado River is a great place for a quick relax and recover session. Know of some other hot springs off the beaten path? Shoot us a note or comment below! We wanna know where you like to go to relax, recover, and unwind.